As an archaeological journalist, I’ve spent much time over the years hanging out with archaeologists in bars and restaurants around the world. Archaeologists are well known for their love of drink, and some of the most liquid evenings I have ever spent were in the company of archaeological teams. So, from time to time, I will write here about the wonderful drinks that archaeologists particularly love—from Greenlandic schnapps (made from the intestinal contents of birds) to Andean chicha brewed from corn fermented by human saliva. But I thought I would start off this series with a huge favorite of many Andean archaeologists: the Pisco Sour. 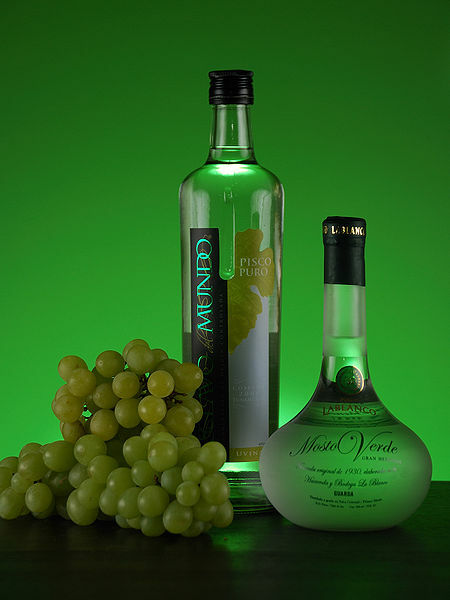 Pisco Puro is a clear brandy distilled from the juice of the black quebranta grape which flourishes in the sunny fields of the Pisco and Ica Rivers in Peru. Spanish colonists brought this sweet grape to the New World and began distilling brandy from it at least as early as 1547, less than a decade and a half after the conquistadors executed the Inca king Atahualpa. My first encounter with a Pisco sour came when I was travelling on assignment to Peru during the very ugly civil war there during the early 90s. The Shining Path guerillas were not only setting off bombs in Lima and shooting entire villages in the Andes, but they were also targeting foreigners. A week before I arrived, they hauled off all the foreign tourists travelling on a bus to the highlands, and shot them, as a message to the international community. All this was rather unsettling both for me and for the Canadian archaeologists I was travelling with. But my story focused on new research on the Nasca culture of Peru’s arid coastal desert, and I had an unforgettable journey. For several days, I travelled with Andean archaeologist Patrick Carmichael by Landrover along the roadless and largely uninhabited Pacific coast: our destination was a Nazca site he had just found by surveying near the mouth of the Ica River. But it was a difficult journey: the Landrover repeatedly broke down, often leaving us stranded hours from any hamlet. But the driver was a gifted mechanic, and every unplanned stop seemed to produce some kind of wonder. At one point, I strolled away from the mechanical problems only to find two human mummies protruding from the sand. Our journey ended in the city of Ica, and I still remember the delicious luxury of clean sheets, running water, and a very good Pisco sour. So here is my recipe for this very South American drink. I’ve adapted it slightly from a recipe in a book I really treasure, Tony Custer’s The Art of Peruvian Cuisine (Ediciones Ganesha, S.A: Lima, 2003). To prepare the sugar syrup: Put one-half cup of sugar in a small saucepan with 3 tablespoons of water, just enough to moisten the sugar. Bring the mixture to a slow boil and while stirring, cook until all the sugar is dissolved. Remove from the heat and set aside for a few minutes. To make the sour: Pour the lime juice and the Pisco into the warm sugar syrup and stir thoroughly to blend the ingredients completely. Pour the mix into a blender jar and add just enough ice to double the volume of liquid in the glass. Blend on high for an additional 30 seconds to crush the ice. Add one egg white and blend on high for one minute. Transfer to a pitcher and serve immediately in either old-fashioned or white wine glass. Place a drop of Angostura Bitters in the middle of the foam in each glass.